Hey, everyone. Been out of the world a bit, relocating and new jobs and family issues have really derailed all the dreams of the past. 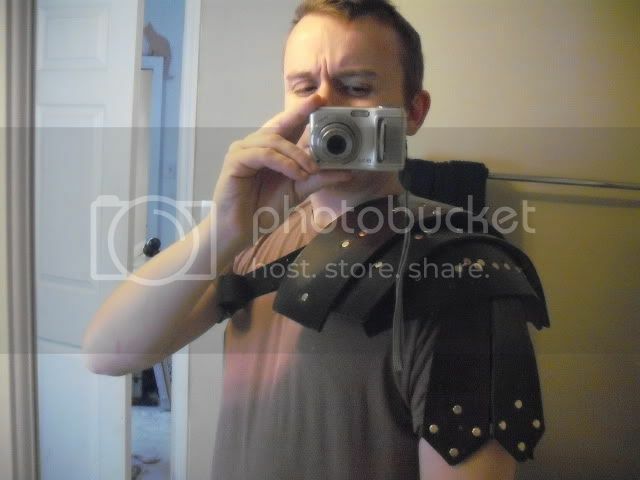 Hope to one day get back into armor production, have a bunch of ideas and projects, just right now more pressing and depressing matters abound! Anyway, to the point. I'm going to try and sell all my old armor and finished unused pieces here to help raise funds to give all my kids a good christmas. Any help at all here would be greatly appreciated! I have great experience shipping acrossed the globe, so that won't be any trouble. I will post pics and everything this evening, I'm writing right now from work. 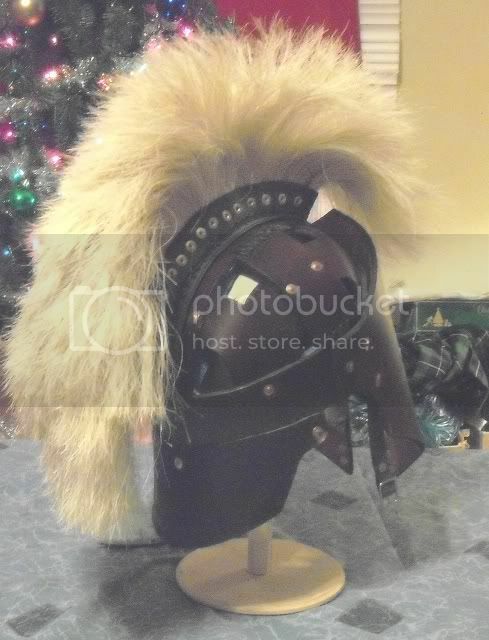 ps: some items will be a helm, bracers, greaves, pauldrons, a war belt, etc. Thanks! I like mistmatched, broken and damaged armor pieces. Lets see what you have. "Gobo, what are you cooking?." "Gobo know, me hate feet"
Sorrry guys, last night was a rough one. I'll have some photos for ya up here soon. Thanks for all the interest and support! 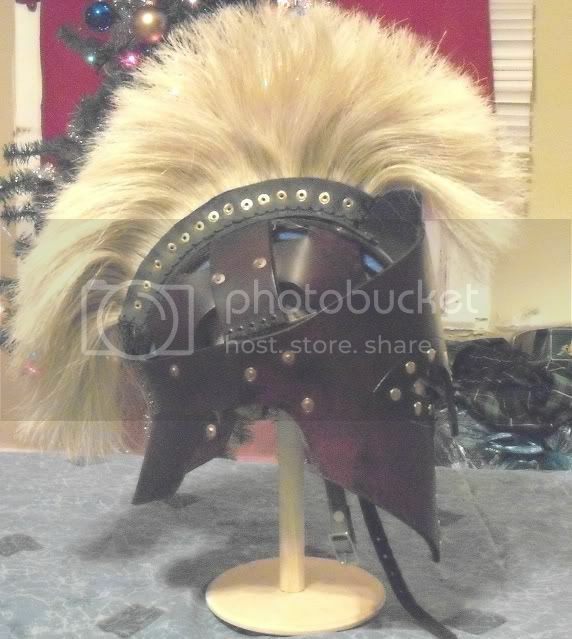 First, pride of the fleet, my old helm. 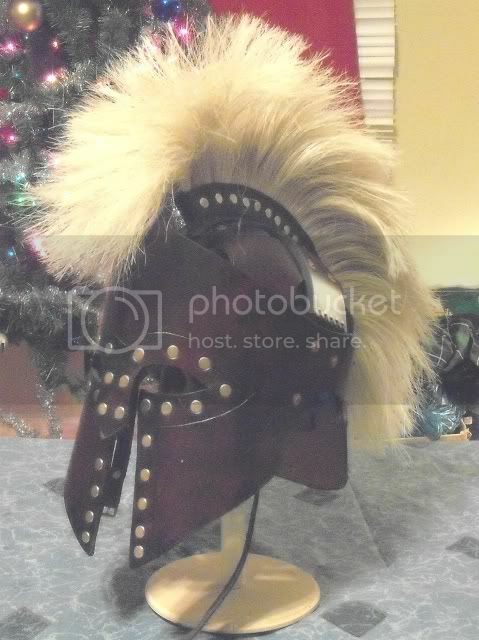 Made in my Corinthian style, from 13-15 leather, dyed natural burghundy, with a real blonde horse hair crest. 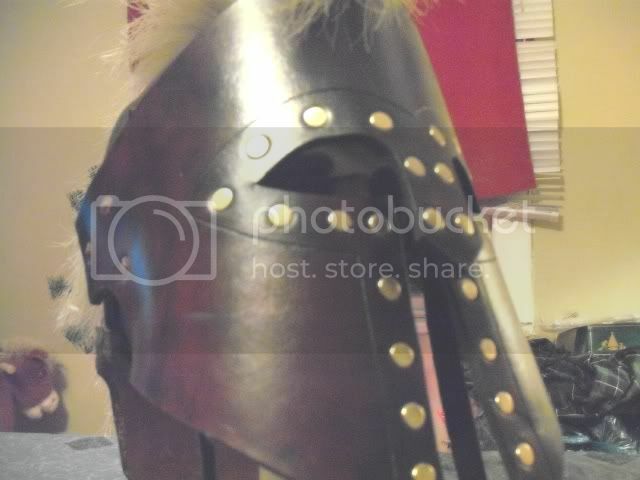 This helm is always an eye catcher. Served me well in an many a battle. I am very proud of it. Used, asking $75. 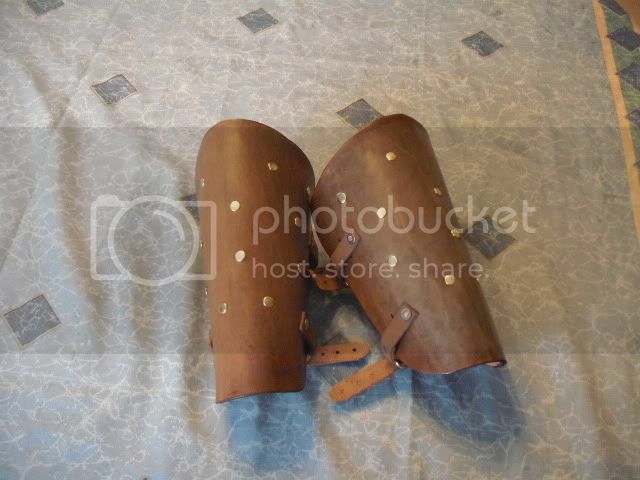 Next, my matching full bracers. Call them full because they come all the way up to the elbow. Lace up for very snug fit. Made from 14 oz burghundy latigo leather, very resiliant yet flexible. Highly decorated with brass spots. 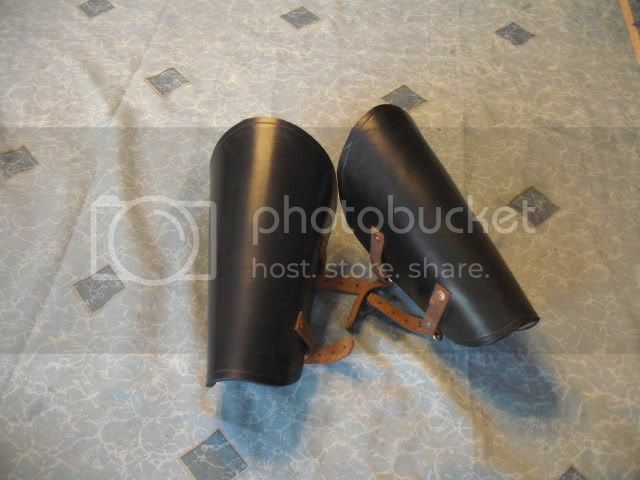 I wore these for many years before making any other armor. Heavily used, asking $25. 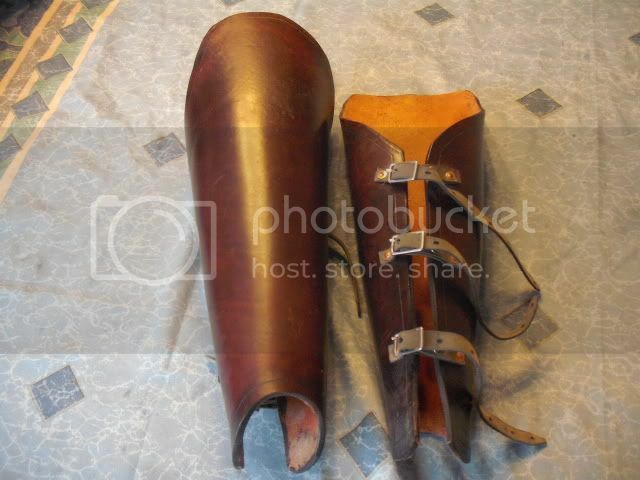 Next up, my old full greaves. Called full because they extend past the knee. Great leg coverage from ankle up past the knee. 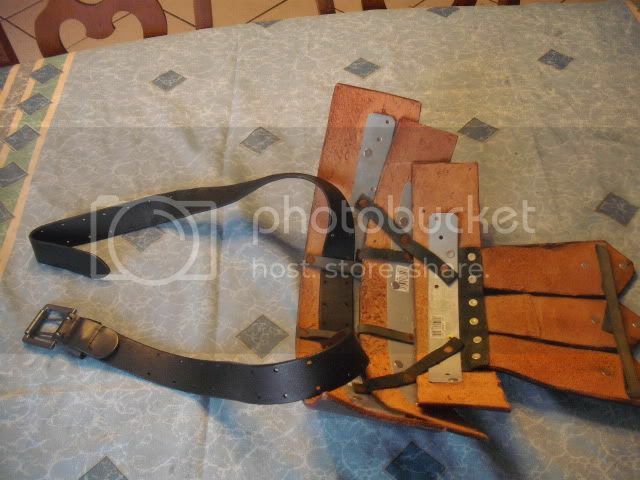 Straps with 3 buckles, dyed natural burghundy, and made from 13-15 oz leather. I was really proud how this design turned out. Moderately used, asking $50. 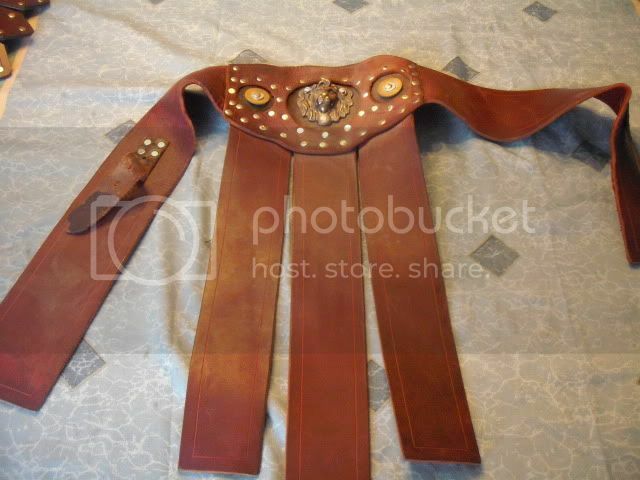 Up next, my old war belt. 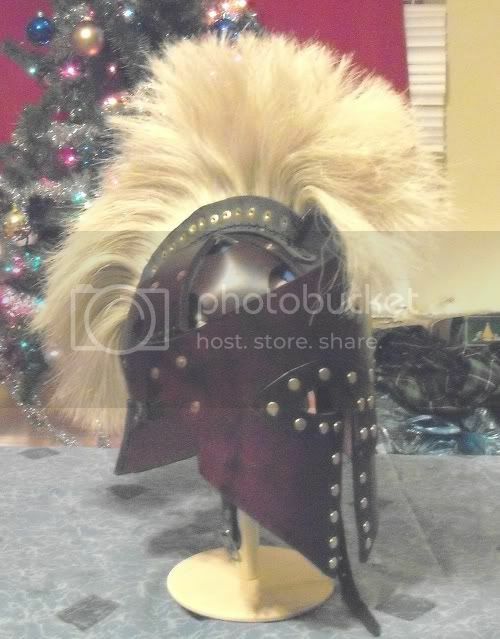 This piece gets as much attention as the helm. 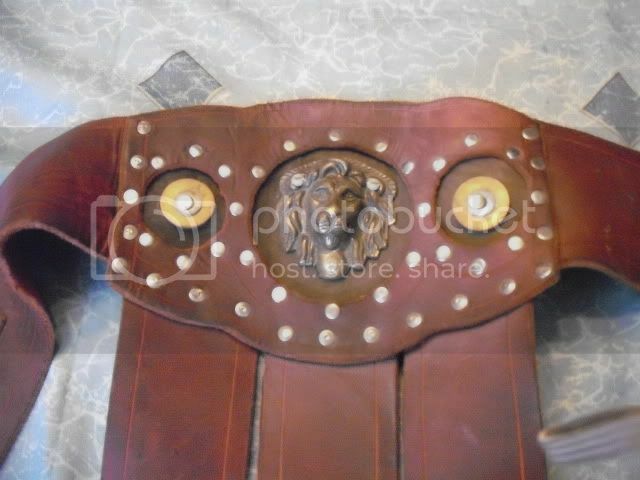 Made from 14 oz burghundy latigo leather, and decorated with a solid brass lion head. This piece always provides excellent groin and waist protection, with no hinderance at all. I have made a number of these for customers around the globe. 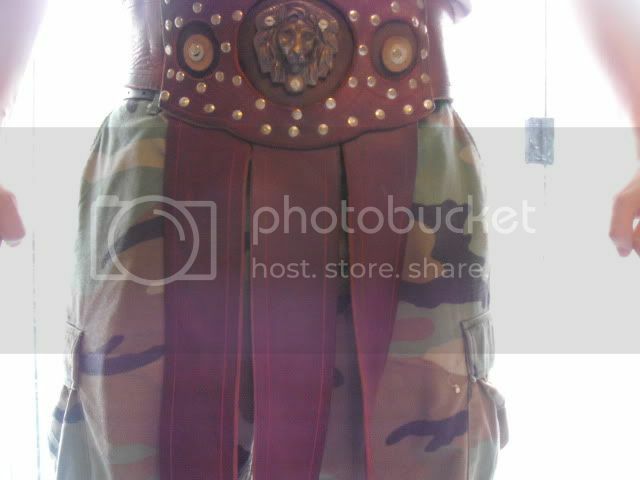 A true warrior's belt. Heavily used, asking $30. Now, we have the new items, items made but never sold or used. 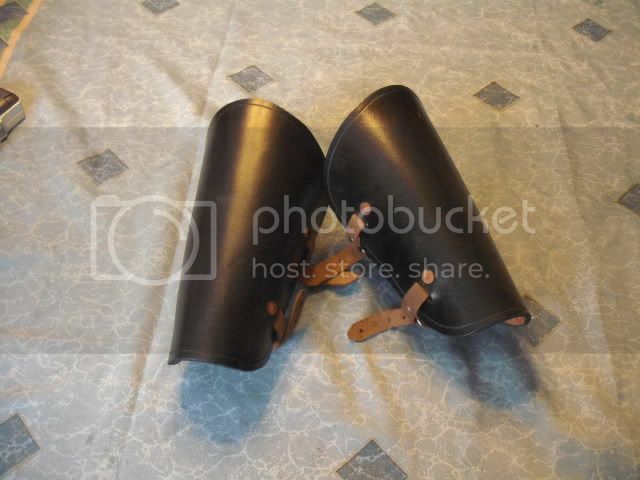 1 pair black bracers, strapped traditional. Made from 13-15 oz leather. Provides superior protection and designed for minimal/no hinderance to movement. New, unused, asking $30. 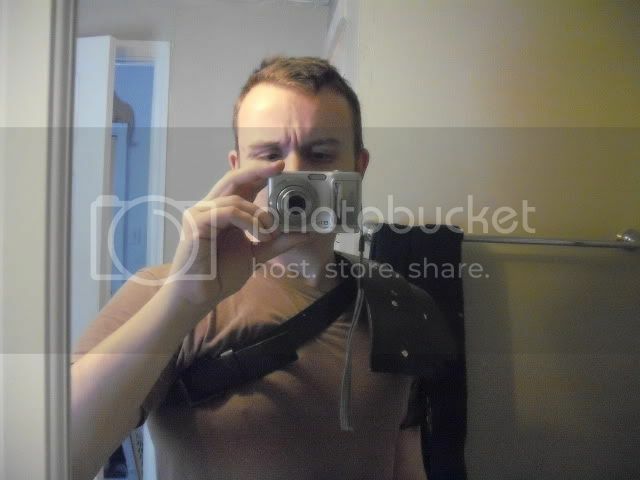 1 pair black bracers, strapped from inside over, for those grapple loving gents. Made from 13-15 oz leather. Superior protection, no movement hinderance. New, unused, asking $30. 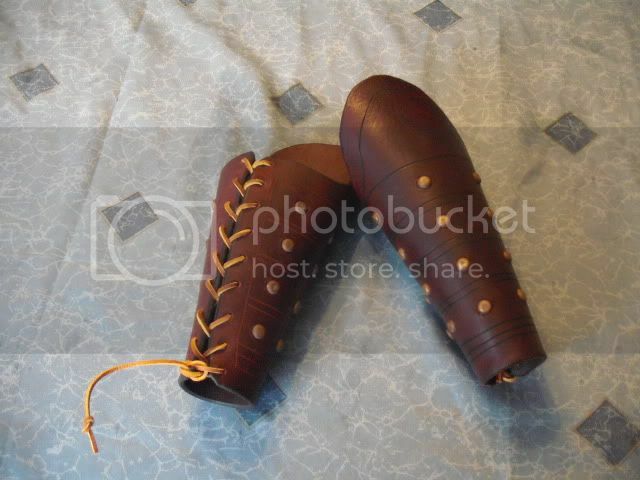 Finally, 1 pair natural brown bracers, strapped traditional, and decorated with brass rivets. 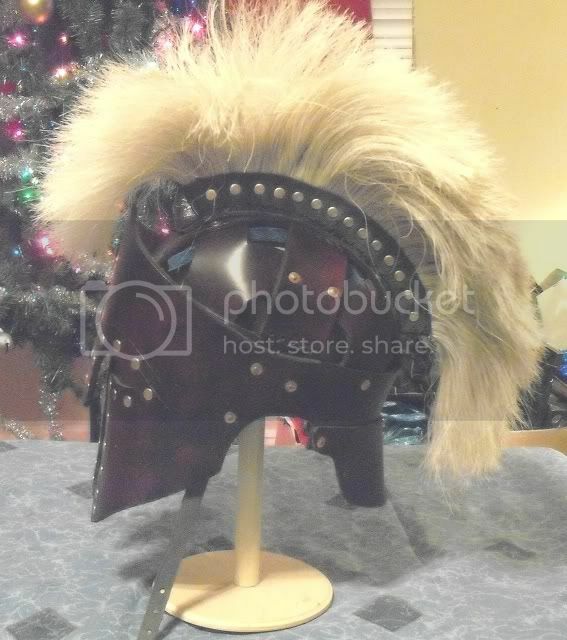 For the barbarian at heart! Made from 13-15 oz leather. Superior protection, no movement hinderance. New, unused, asking $35. Thanks everyone for all the support and help here. Hope everyone is well and not too battle wounded! 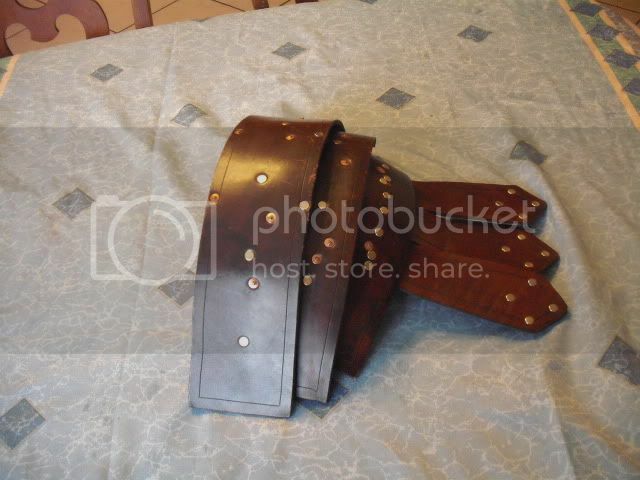 I want the belt, and the shoulder, do you have a paypal? Sent ya a PM. Thanks! 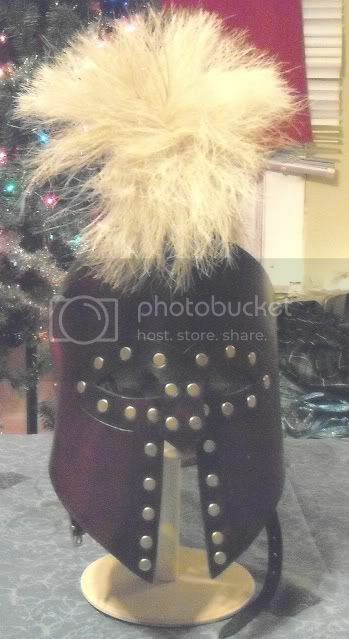 is your helm still available? ?